A small town divided by water. 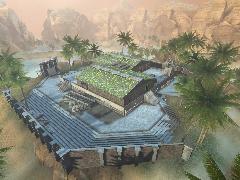 This is a medium-sized open map for 12-24 players. 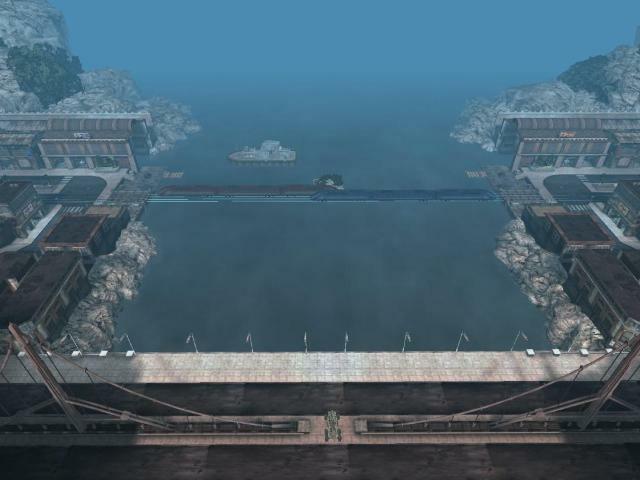 The middle part of the map is covered in water and you can cross it by jumping on top of passing by trains, taking a ride on the boat in ports, using the bridge, flying the cicada or manta, just swimming or, if you're pro enough, using the jump boots, speed combo and shield jump at the same time. There's a lot of powerups (DD, jump boots, pickup of invisibility) and also super weapons such as redeemer, ion painter and even nuclear strike painter. 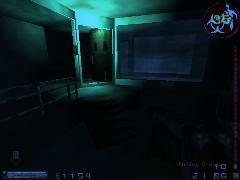 The map is a remake of the VCTF-TrainCrossing map from UT3. Bots act stupid. They don't use trains\boat, don't know what to do with jump boots, can't access super weapons and sometimes get stuck. Also I removed all bot paths in the water because otherwise they ignore the bridge. Trains and boat are a little bit laggy when playing online. Jump boots are probably OP, as said in the description, you can cross the river using them, speed combo, shield-jump and the island in the middle. But that's the reason I made them so OP, and also they aren't fun otherwise.